852243 SW Darth Vader T-shirt was a T-shirt released in 2009 by LEGO. It has a LEGO Darth Vader minifigure designed on it, with his famous phrase from Episode IV, "The force is strong with this one", written below. The T-shirt is black and available in various sizes. 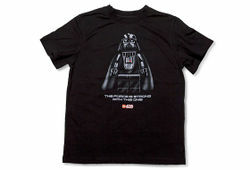 It shares its design with 852243 SW Darth Vader T-shirt. This is a description taken from LEGO.com. Please do not modify it. The Force is strong with this one! Even Darth Vader can tell that the Force is with you when you wear this striking black LEGO Star Wars T-shirt. Available in Youth sizes YS (Small), YM (Medium),YL (Large), and Adult sizes S, M, L, XL and XXL. Available in Youth sizes YS (Small), YM (Medium),YL (Large), and Adult sizes S, M, L, XL and XXL. Facts about "852764 LEGO Star Wars Darth Vader T-shirt"
The Force is strong with this one! Even Darth Vader can tell that the Force is with you when you wear this striking black LEGO Star Wars T-shirt. Available in Youth sizes YS (Small), YM (Medium),YL (Large), and Adult sizes S, M, L, XL and XXL. Available in Youth sizes YS (Small), YM (Medium),YL (Large), and Adult sizes S, M, L, XL and XXL. This page was last edited on 9 January 2016, at 23:58.